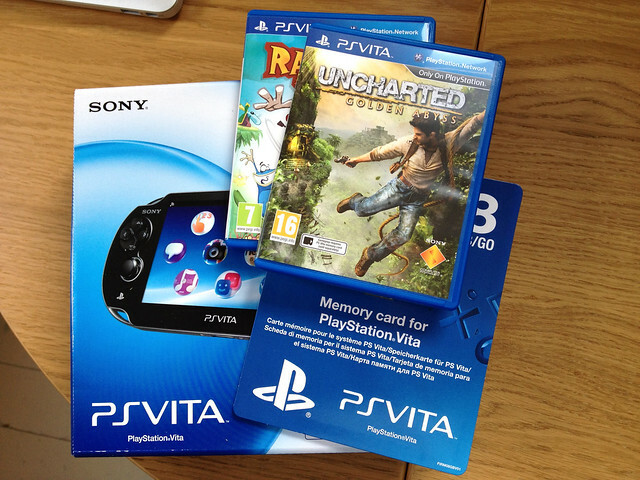 I recently bought a PlayStation Vita, Sony’s new handheld games console. This article is a brief overview and review of the device, focusing on screenshots and discussion of its UI and interaction design. All screenshots shown here are smaller than actual size (they’re two-thirds of actual size, in fact - shown here at 640 x 363, whereas the native screen size of the Vita is 960 x 544). You can click each one to go to Flickr, where you can zoom to a full-size version. I took all screenshots on the device itself, by simultaneously pressing the PS and Start buttons. The Vita packaging uses a swooshy blue and white colour scheme, creating a vague mental association with expensive electric toothbrushes, but we don’t hold that against the device itself. A USB cable, terminating in a proprietary connector. A power brick, which accepts the USB cable, and a further cable with a plug. A pack of AR cards. There are three free games on the PS Store that make use of the cards: Fireworks, Cliff Diver, and Table Football (or Table Soccer in the US). A Getting Started Guide leaflet, running to about four A4 pages. Assorted papers regarding safety warnings, warranties and such. The packaging is no bigger than it needs to be, and looks to be entirely recyclable, without any foam inserts. So that’s good. The Vita itself is solid, but pleasantly light. It’s larger than a Nintendo 3DS, but not ridiculously so. Here’s a photo of both handhelds alongside an iPhone 4S. Subjectively, and perhaps due to its greater width and thickness, despite being 20g heavier than the 3DS, the Vita seems slightly lighter than Nintendo’s device. Both are comfortable to hold for extended periods. 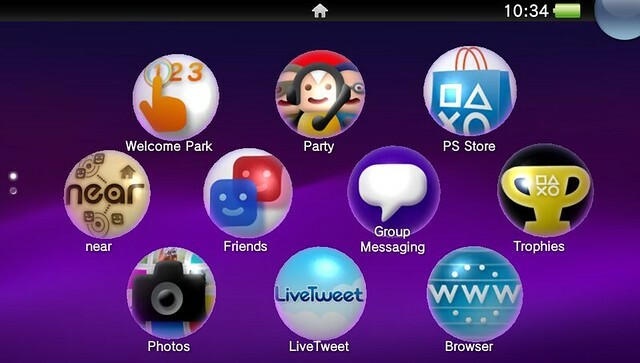 The Vita’s Home screen uses vertically-tiled screenfuls of 10 ‘pebbles’ (each representing either an app or game), presented in a 3-4-3 arrangement. The Home screen interface is navigated entirely using the touch-screen; the many hardware buttons (except the PS and Power buttons, of course) have no effect here. This is the initial primary (topmost) Home screen. I’ve added LiveTweet (more about it later) to it, and changed the background colour to purple from blue. The page-indicator dots on the middle-left show that this is screen 1 of 2, with the second screen below this one. Each screen can have its own background colour, with an automatic smooth transition between colours as you switch screens. Pebbles are freely arrangeable within the 3-4-3 constraint, and gaps are permitted anywhere. The bubble on the top-right opens the Notifications pop-over, which shows events like friend requests, app downloads, update downloads, and so forth. If any LiveAreas (again, more on those later) are open, they can be horizontally swiped to from here. Each game you’ve inserted (or downloaded) installs an icon onto the Home screen, which persists even if the game-card (for physical retail copies of games) isn’t currently inserted into the device. 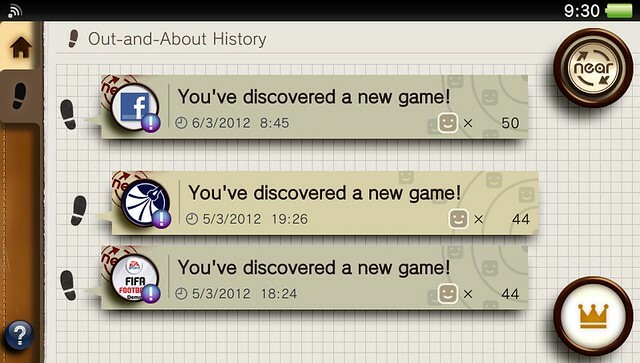 Attempting to launch such games will cause the Vita to ask you to insert the relevant game-card. The aliasing around the edges of the pebbles is much more noticeable in screenshots than it is on the device itself, because the pebbles are in constant subtle motion. The Home screen can be put into Edit mode by tapping and holding on any pebble, or on any blank area of the screen. The first time you do so, you see an iOS-like hint dialog. 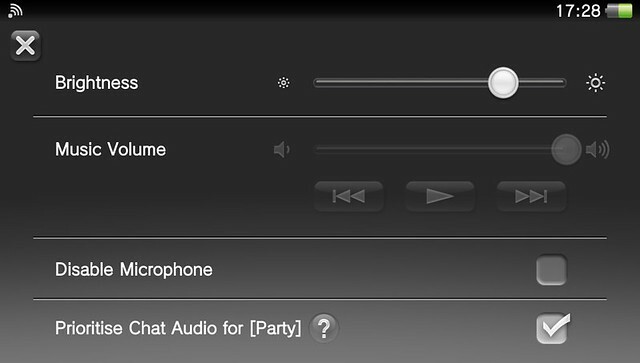 Once in Edit mode, various new interface elements appear to allow you to customise the display. In Edit mode, you can rearrange icons or entire screens, add or remove screens, customise the background colour/pattern of each screen individually, and obtain version information and update history for relevant apps and games. Non-built-in icons can also be deleted. 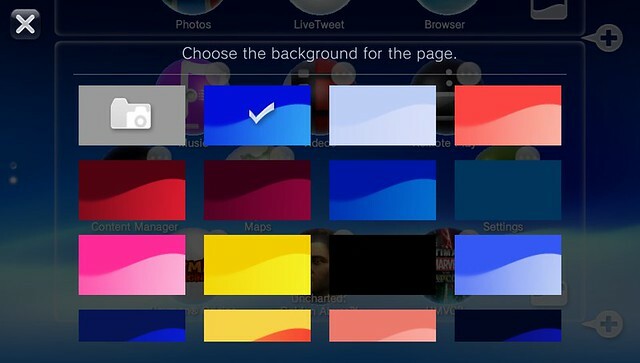 When changing the background colour of a screen, you’ll see a predictably-swooshy set of Sony background patterns to choose from. You can also pick a photo from your library. The Vita’s menu system includes the amusingly-named concept of LiveAreas, which are essentially hub screens for apps or games. LiveAreas appear whenever you tap an app or game on the Home screen. 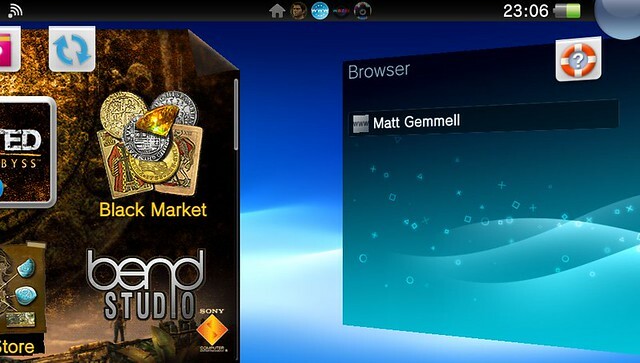 Some LiveAreas contain only a single button, to actually launch (or resume) the software, but apps/games can customise their LiveArea as they wish. The Maps LiveArea, for example, has recent directions, the browser has open tabs, and some games have links to their web site, DLC (downloadable content), and so forth. 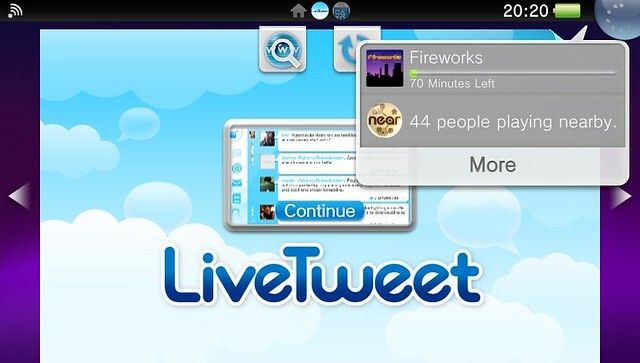 This LiveArea has several actions available. Along the top, there’s a web link which searches the web for this game’s name, then the electronic manual for the game (both this game and Uncharted didn’t come with any paper manual, though Rayman did), and a button to (I believe) check for updates to the game. 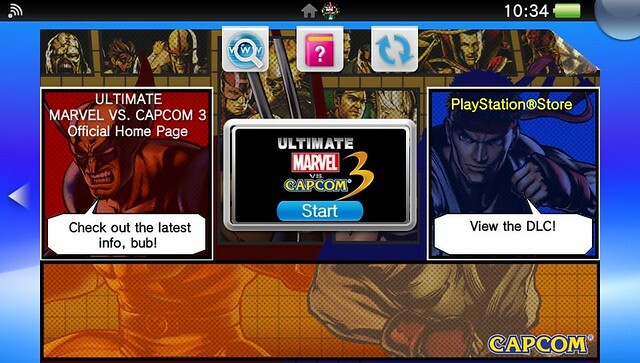 In the middle of the screen, there’s a large button to visit the game’s homepage on the web, then the standard ‘Start’ button (it would be ‘Continue’, and would show a thumbnail of the game’s current state, if the game was already running), and finally a link to the Marvel vs Capcom DLC (downloadable content) in the PlayStation Store. Finally, the orange panel at the bottom contains auto-scrolling text with a summary of the changes and additions in the most recent update to the game. This LiveArea is reasonably typical for a Vita game, and shows the degree to which apps and games can customise the screen. LiveAreas are closed (which will also quit the app or game, if it’s running) by peeling the top-right corner away, which is suitably animated. 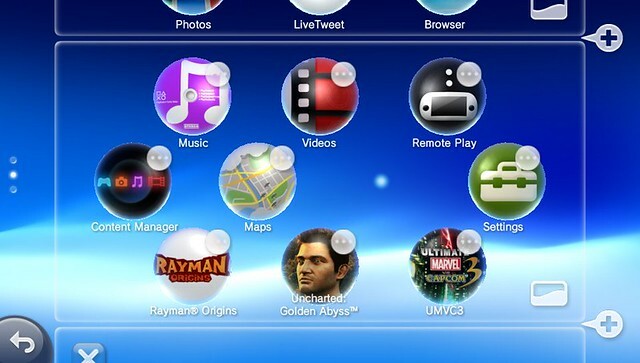 When using an app/game, you return to its LiveArea by pressing the PS button. If you then press the PS button again, you see a stacked “cards” screen of LiveAreas, which shows all open LiveAreas simultaneously. You’ll also notice that the status bar at the top of the screen shows an icon for each open LiveArea besides the Home screen. 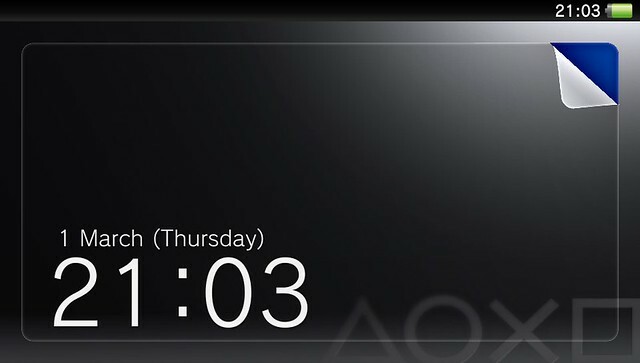 The Vita’s lock screen (which Sony calls the Start Screen) uses the same mechanic as closing a LiveArea: peeling the top-right corner, in this case to unlock the device. The page-corner is always visible, which is sure to drive some people crazy. You can select any photo from your library to use as the backdrop to the lock screen (view the photo in the Photos app, then choose “Use as Start Screen” from the “…” options menu). You can add a 4-digit passcode code if you wish, which you’ll have to enter after peeling the corner. If you enter an incorrect passcode 5 times in a row, you will no longer be able to unlock the device, and must restore it. 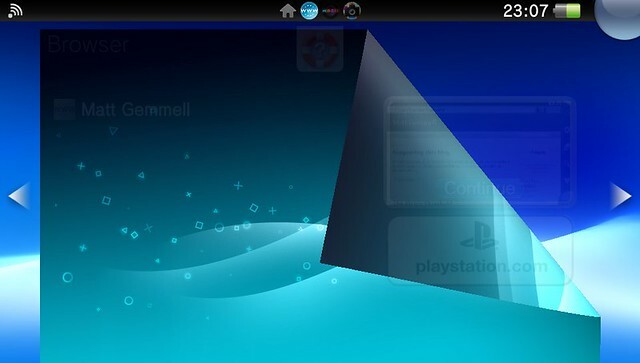 At any time when using the Vita, you can press and hold the PS button to see an overlay dialog. It allows adjusting the screen’s brightness (the Vita doesn’t have an ambient light sensor), and configuring various audio-related options that you might need quick or frequent access to. The Vita’s screen is set to about 80% brightness by default, and I’ve yet to find any reason to change it. The screen is vivid and beautiful, and easily viewable at any angle. The keyboard is extremely responsive, which is really a characteristic of the screen (only the very barest feather-touch is required; it definitely feels more responsive even than iOS devices, and multi-touch is supported). 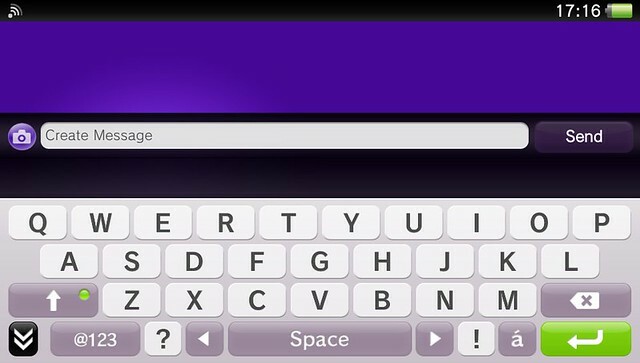 The keyboard doesn’t autocorrect your typing, but it does provide multiple suggestions (in an extra bar that appears along the top of the keyboard). When inputting parentheses etc, matching closing characters are automatically inserted and the insertion-point placed inside them. The letters on the keys are in uppercase in the above screenshot because the Shift key is engaged (that’s why the small indicator light within it is lit green) - when in lowercase mode, the letters are shown in lowercase, which is a nice touch that iOS could learn from. The arrows on either side of the spacebar are cursor-keys, for easy navigation through text. You’re of course also free to tap in the text itself, and if you tap and hold, the text field will magnify to allow finer control over positioning, as in iOS. There’s also a numbers and symbols mode, available via the “@123” key. The up/down-arrow buttons cycle through four screens of symbols, leaving the numbers always available. 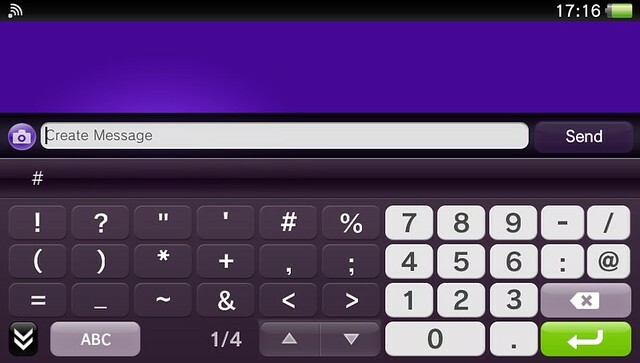 The num-pad layout of digits is very helpful when typing. Overall, it’s an excellent touch-screen keyboard implementation. In terms of storage media, the Vita accepts only its own game cards (and its own custom memory cards too), but the device itself is compatible with almost all PSP and Playstation minis titles, when downloaded from the PS Store. There’s already a vast array of PSP titles available to re-buy and download immediately. The Vita also supports a new feature called Cross-Play, which is also supported on the PS3 with a system software update. 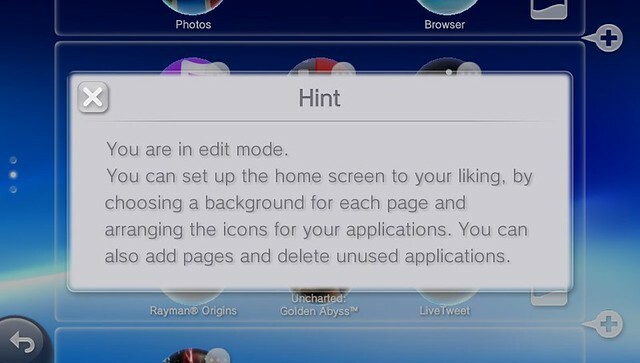 For compatible titles, it allows you to begin playing on one device (PS3 or Vita), then pause the game and resume playing on the other device. There’s been word of discounts or free downloads of the ‘other’ version of suitable games when you buy one copy too. I’ve not tried it out myself yet, but for those with a PS3 too, it could be very useful (say when you’re already playing the PS3, but then your husband or wife wants to watch the TV). In a word, the Vita’s performance is stunning. I’ve been frequently gobsmacked at the graphics, particularly in Uncharted, and the idea that a handheld device can produce such visuals. I’ve not noticed any lag or frame-rate problems, and generally the entire device reeks of quality and science fiction. My brother, who got his Vita a few days before me, wasn’t wrong when he characterised it as being like having a PS3 in your pocket. One particular aspect that struck me is pausing/resuming games via pressing the PS button to return to a game’s LiveArea, then tapping the relevant portion of the LiveArea to zoom back into the game and resume it. It’s completely smooth (with animated zooming transition) every time, with absolutely zero lag. You’re playing the game, then you’re zoomed out to an immediately-swipeable LiveArea/Home interface, then you zoom straight back into the game in progress. It really has to be seen to get the full effect. The Vita is a powerhouse of a device, with a large screen and with both Wi-Fi and Bluetooth networking capabilities (and indeed 3G, if you buy the more expensive model), all of which are notoriously draining on a battery. Thankfully, battery life is more than acceptable. Sony’s official specs estimate around 4.5 hours of battery life, and that’s entirely in line with my own observations (and those of various online publications). A full recharge takes somewhere between 2 and 2.5 hours. A full battery in the morning will provide more than enough power for gaming throughout two lengthy commutes, plus lunchtime and your coffee break, with power to spare. You will probably charge the machine every night, and even perhaps once during the day too if you’re a heavy user, but that’s in keeping with the Nintendo 3DS’ battery life too. External battery packs are sure to become available soon (the Vita’s built-in battery is not designed to be readily removable; there’s no battery hatch or cover on the device, since most of the back is taken up by the rear touch-panel). The Vita is capable of connecting (via USB) to either a PlayStation 3, or to a computer (PC or Mac). In the latter case, a piece of free desktop software from Sony called Content Manager Assistant must first be installed (you can download the Mac version here). 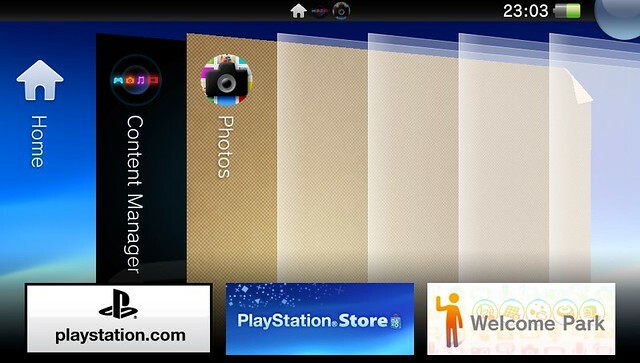 After connecting the USB cable and ensuring that Content Manager Assistant (CMA) is running on the computer, you tap Content Manager on the Vita’s Home Screen, then make appropriate selections, allowing you to copy apps, saved data and other content (such as photos/screenshots, music etc) between the device and the computer or PS3. You can also back up and restore data on memory cards inserted into the Vita. I initially had connection issues with the Mac version of CMA, but they were resolved after I’d rebooted my Mac (almost certainly coincidental, as CMA is just an app that doesn’t install anything outside of its own bundle in /Applications) and set CMA to use only folders on my boot drive as destinations when copying content from the device; previously, I have it set to use my Pictures folder, which I keep on another hard drive. Since I made that change, CMA has been working flawlessly. Update: I encountered error number C0-11018-1 when attempting to back up the Vita to my Mac. It occurred to me that I had the Vita’s USB cable connected through a rather old and cheap USB extender cable. When I switched to a newer USB extender, or connected the Vita directly to the Mac, the connection issues went away and I was able to backup successfully. The Vita naturally includes a PlayStation Store app, allowing you to buy games and downloadable content (including renting or buying movies). A most welcome feature of the Vita is that it supports true background downloads, with a progress bar always being available in the global Notifications pop-over when you’re either at the Home screens or in a LiveArea. 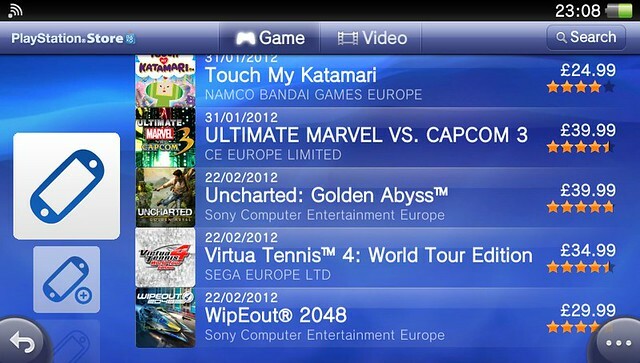 It seems that Sony are releasing all games simultaneously in both retail packaging, and as electronic downloads. 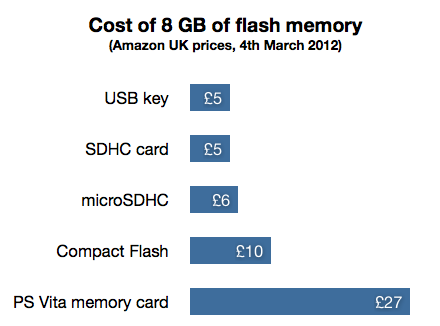 The prices on the PlayStation Store seem to be the same as retail too (or even slightly less), which is refreshing - though note that if you’re going to download your games, you’ll of course need appropriate storage space on Sony’s painfully pricey proprietary Vita memory-cards. As mentioned before, the Store offers not only Vita, but also PSP and PlayStation minis titles too. Near is an app that allows you to find nearby Vita players and see what they’re playing (if they’ve explicitly opted-into that functionality, of course). You can choose whether to share your PSN online ID (if you don’t, you’ll be shown anonymously), and Near maintains a history of your location updates (which seem to be throttled to once per hour, at least in the same location). The exact distance within which people are considered to be “nearby” isn’t stated, but various online forums suggest it’s likely to be in the 10 miles (about 16km) range. 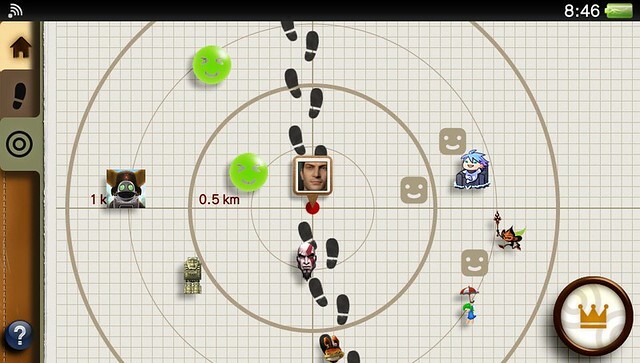 Here in Edinburgh, Scotland (UK), I found fifty nearby Vita owners on the morning of 6th March 2012. It’s important to note that only the relative proximity of players is shown; you can’t find anyone else’s actual physical location, nor can they find yours. The “Radar” display is strictly an abstract radar-like screen, and is not overlaid on (nor does it precisely correspond to) a real map. 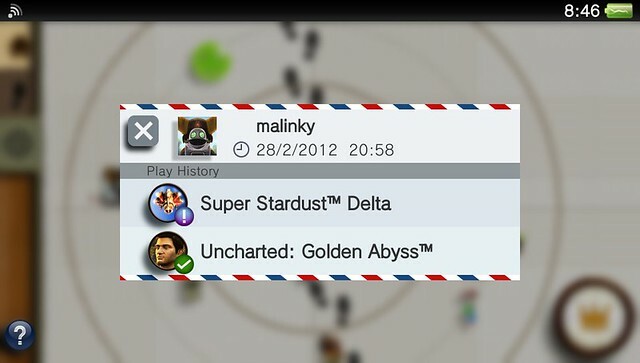 The games a person owns and is playing are shown, with a badge to indicate whether you also own that game (or app). Finding a player who has a game you do not yet own is considered a “discovery”. It’s also possible to exchange virtual goodies between non-anonymous players, though I’ve yet to try it. Near is a well-implemented feature, though I remain skeptical as to its utility for anything more than passing interest. Knowing the approximate proximity of other players isn’t necessary for online gaming, and the system (thankfully) offers no way to pinpoint actual locations, nor to directly communicate with anyone who isn’t already on your PSN Friends list. It’s worth noting that Sony has clearly considered the privacy and security implications of Near, taking care not to offer anything but a very general sense of “nearness”, and allowing fully anonymous use. Near also allows setting up a list of Private Games (games about which your usage data will not be shared), and (more importantly) Private Zones: physical locations from which you will always appear as anonymous, regardless of whether you’ve chosen to share your PSN online ID generally. Your own home address would presumably be a primary example. Front- and rear-facing (single) cameras, and an app to take photos and browse your existing photos and screenshots. A global notifications system, with history. New notifications can optionally play a sound and/or illuminate the PS button, as well as displaying a banner when the device is active. PSN (PlayStation Network) support, with trophies, friends, messaging, group chat, etc. Screenshots can be taken (almost) anywhere by pressing PS and Start simultaneously. Screenshots are viewable in the Photos app, and are handily categorised as screenshots rather than photos, and grouped according to the app or game you were using when you took them. Games can choose to disable certain system features if they wish. For example, Marvel vs Capcom disables screenshots (ostensibly to avoid spoilers), and Uncharted disables network features at certain points in order to maximise performance. 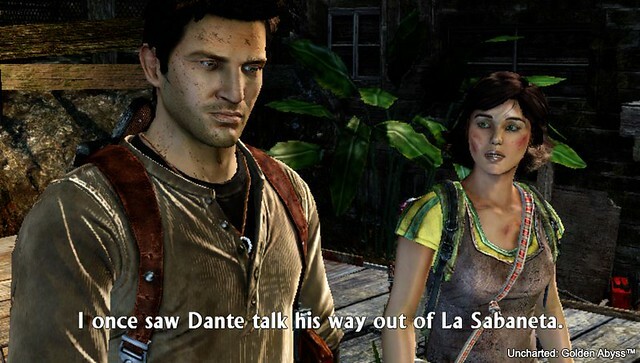 Games can also annotate or otherwise modify screenshots taken while they’re running (for example, Uncharted adds the name of the game in small text on the bottom-right). 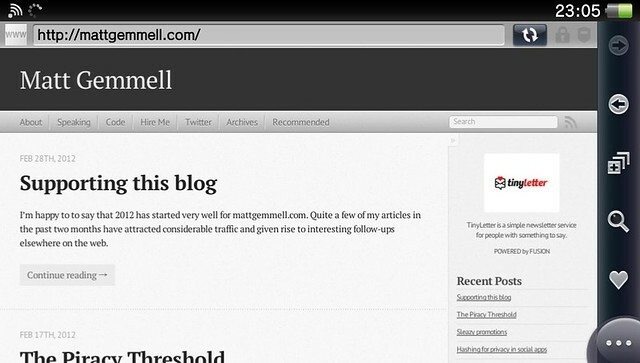 The web browser is capable and responsive. I very much miss iOS’ intelligent content-aware double-tap to zoom, though. 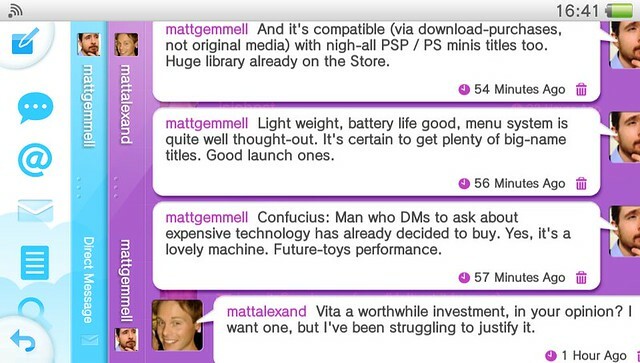 Whilst the Vita does not ship with a Twitter app, there’s one available as a free download from the Store, called LiveTweet. It’s remarkably fully-featured and usable. 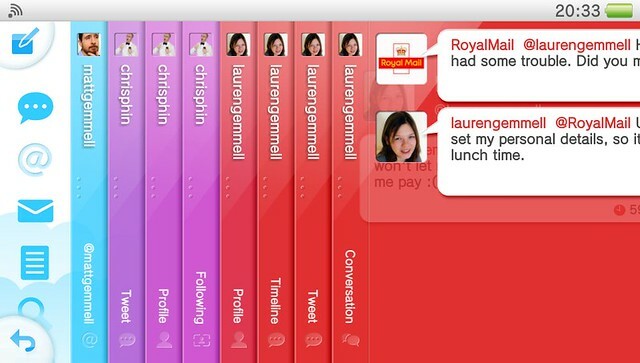 The UI is reminiscent of Tweetie (now the official Twitter app) on OS X, with a set of side-tab icons for the various sections. It even supports pull-to-refresh, which is a relief. There’s also a cute visual touch whereby if you’re writing a reply, you see the tweet that you’re replying to in a thought-balloon attached to your user photo. Posting tweets, viewing embedded media, favourites, user profiles, mentions, direct messages, lists and so forth are all supported too. There’s an interesting hierarchical navigation interface, using a vertical bar (with a grip-strip) just to the right of the main icon tab-bar. Tapping the bar expands it to show a bar for each level of the hierarchy you’ve navigated, and tapping any bar will take you back up to that level. Successive levels are automatically colour-coded to visually distinguish them. It’s simple and effective. There are a couple of rough edges at the moment (every apostrophe in any displayed tweet seems to have a superfluous space after it, for example, and neither emoji nor graphical representations of plain-text emoticons are currently supported), but those are minor quibbles which are sure to be ironed out in future. 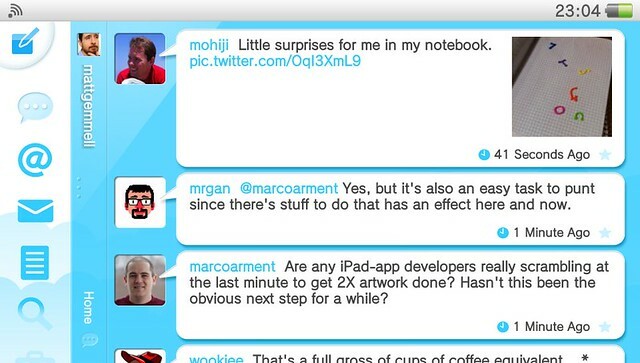 LiveTweet is an impressive Twitter app, all the more so for being a 1.0 on a new platform. Given that it’s also entirely free, every Vita owner should make sure they have it. 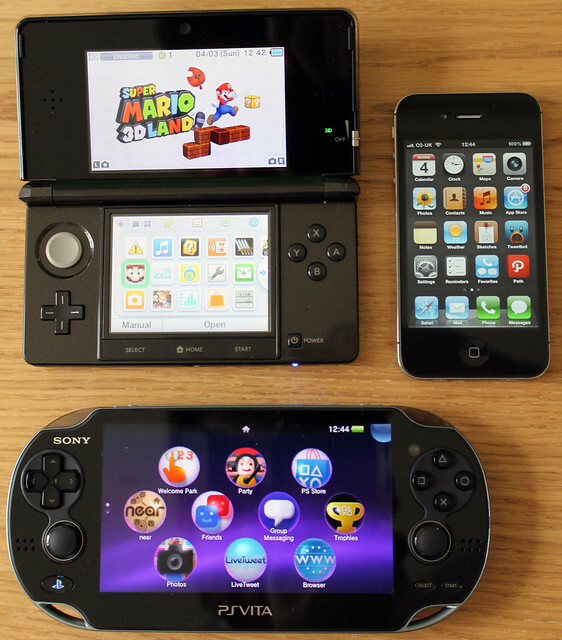 The Vita and the Nintendo 3DS are so different as to not be meaningfully comparable. Both devices support a huge library of older games as well as their own (the 3DS supporting DS game-cards too), and both are excellent gaming machines that each have compelling titles already available. Make a decision based on the games you want to play, not on irrelevant and superficial factors like graphics. Either device is an excellent choice. Pick one, and buy it - or get both. Neither detracts from the other, no matter what children on web forums might say. The Vita is a compelling device, with exceptionally impressive performance, reasonable battery life, and a usable, responsive user interface. There aren’t any major down-sides or problems that I’ve noticed. It’s sure to get plenty of attention and big-name titles, including new instalments of the various beloved Sony game franchises. If you’re in the market for a portable gaming device, I can recommend it without hesitation - as I equally would for the Nintendo 3DS (which I reviewed earlier), and any iOS device. If you’re interested in buying a PS Vita, Amazon (as ever) have some good deals. If you’re in the UK and want to buy a Vita from Amazon UK using this link, I’ll get a modest commission, and it won’t affect the price you pay. I also have a number of Vita games on my Amazon Wishlist (ahem). 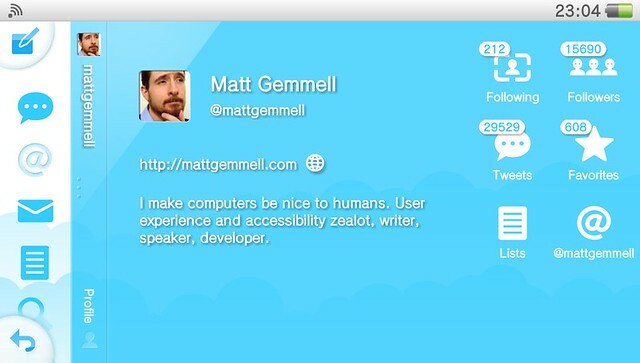 If you’re like to share your thoughts on the Vita or any other topic, You should follow me (@mattgemmell) on Twitter. 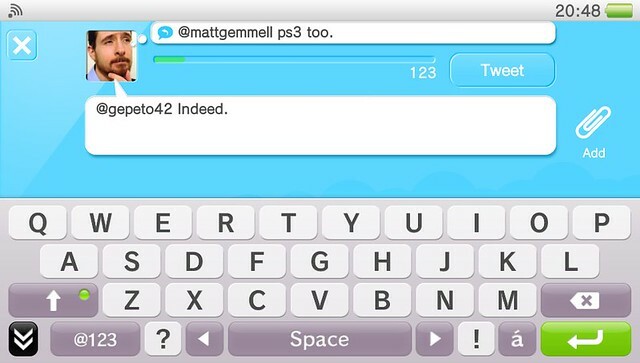 If you’d like to add me on PSN, I’m also mattgemmell (two Ts, two Ms, two Ls) there. 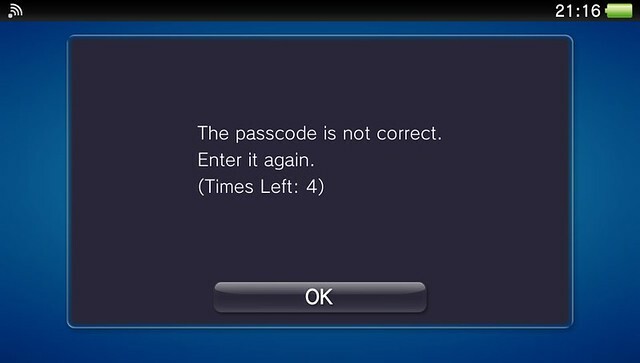 After I published this article, I found a useful list of PS Vita error codes and their meanings.